IMPORTANT: You can schedule custom data forms (or form groups) for deployment to devices using the Scheduled tasks tool (Tools > Distribution > Scheduled Tasks). Before forms will display on the device, you will also need to enable display of forms in the Agent Configuration tool (Tools > Configuration > Agent Configuration > (double-click the applicable configuration in the list) > Custom data forms >select the display option you want to use). New: Indicates the form has never been filled out by this user. 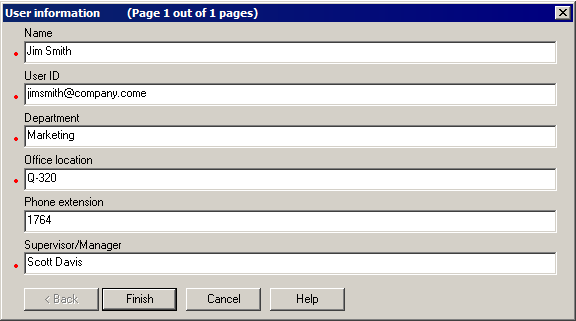 Completed: Indicates the user has opened this form and filled out, at a minimum, the required fields. Do again: Indicates the user has completed this form before, but the form has since changed. The user needs to look at the form again and make any necessary changes. Once this is done, the form's status changes to completed. Once users select a form to fill out and click Open, a simple form wizard appears. It contains a list of questions and fields for answers. If there are more questions than fit on a page, there are Back/Next buttons. Users can click Help (or press F1) while the cursor is in a field to display a help message generated by the Description field in the form designer. Users must answer any required questions before continuing to the next page or exiting a form. Required questions have a red dot beside them. The last page of the form wizard has a Finish button that users click when they're done. Clicking this button returns users to the Form selection dialog where the status message beside the form name is updated.